Looking for a way to reduce your water consumption? 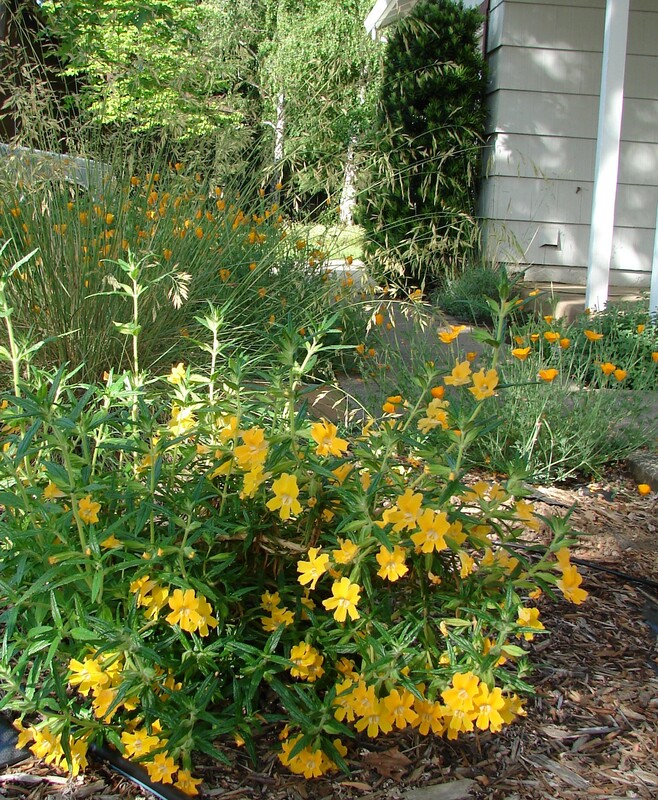 A garden of native plants offers color, texture, pollinator and bird habitat, seasonal interest, and the single biggest opportunity for water savings for most homeowners. No argument: lawns make an unbeatable playing surface. But many lawns, especially front yard lawns, are rarely tread upon. Too often, they are grown by default for their reliable greenery. But that greenery comes at a high cost. Landscape irrigation accounts for 75% of residential water use in Butte County. Replacing lawn with drought tolerant native plants can cut landscape water use by over 80%, resulting in potential savings of around 750 gallons per week during the peak of summer for every 1000 square feet. Keeping lawns lush and healthy expends resources in addition to water. Pesticides, fertilizers, and herbicides applied to lawns can pose health risks to humans and leach into waterways. Gas-powered lawn mowers produce as much as 5% of the nation’s air pollution each year. Native gardens, in contrast, provide beauty that is truly green. First, observe. What existing trees and plants, besides your lawn, do you want to keep or remove? What are the sun and shade patterns? What types of grass grow in your lawn? Do you have an existing irrigation system that can be used for your new plantings? Next, kill your lawn. Homeowners can use either of two eco-friendly methods to kill their lawns. Solarizing is done in full sun during summer and takes 4-6 weeks. It works best on fescue, ryegrass, and bluegrass, with limited success on Bermuda grass. Sheet mulching can be started any time of the year. It takes 6-12 months, works in sun or shade, and is effective on all grasses, including Bermuda grass. See my earlier posts for step by step instructions for solarizing and sheet mulching. Finally, replant. Whichever method you choose, time implementation so that you are ready to replant in the fall through early spring when cool temperatures and moist allow native plants to develop the healthy roots they need to thrive with little water during the heat of summer. 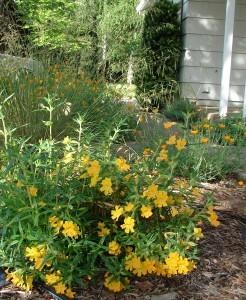 Sticky Monkey Flower: great for pollinators and your water bill. 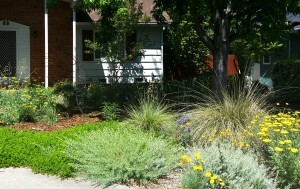 It’s a fine balance: a native garden can add so much to your garden while subtracting a chunk from your water bill. This entry was posted in Uncategorized and tagged drought tolerant gardening, dry gardening, habitat gardens, kill your lawn, low maintenance gardening, native ca plants, native gardening, pollinator gardens, replace your lawn, sheet mulching, Solarizing on June 4, 2015 by admin.